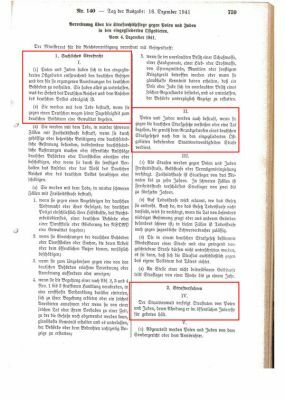 The material presented here shows the way in which the Reich Ministry of Justice voluntarily shed the basic principles of the rule of law. Thus, Franz Schlegelberger supported the idea that judges should "work on behalf of the Führer", take the political ideas of the Nazi Regime as a backbone of their rulings and be responsible not to the code of law but ultimately to Hitler and his murderous, racist ideology. 1. Professor Schlegelberger’s career can be considered as a typical example of the integration of the conservative elite into the Nazi Regime. Why do you think the young Nazi movement integrated the old elite and what made Schlegelberger participate? 2. After the war Schlegelberger maintained that he wanted to prevent the worst by making small concessions. Discuss whether this is an appropriate strategy or not. Short notice in the Völkische Beobachter on Schlegelberger appointment, 31 January 1941. Source: Völkischer Beobachter, 31 January 1941. State Secretary Schlegelberger’s letter to Hitler, 10 March 1941. Source: Vierteljahrshefte für Zeitgeschichte, 6 (1958), p. 417. State Secretary Franz Schlegelberger at a conference of senior court presidents, 23 April 1941. Source: Dokumente zur “Euthanasie”. Ed. 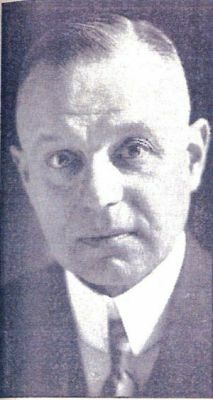 Ernst Klee. Frankfurt a.M. 1985. pp. 216/218. Translation in: Nazism 1919-1945. A documentary reader. Ed. by J. Noakes and G. Pridham. – Repr. Exeter: Univ. of Exeter Pr. Vol. 03. Foreign Policy, War and Racial Extermination. – 1988, pp. 1032/1033. The case of Marcus Luftglas. Source: Nazism 1919-1945. A documentary reader. Ed. by J. Noakes and G. Pridham. - Repr. Exeter : Univ. of Exeter Pr. Vol. 04. The German home front in World War II. – 1998, pp. 141/142. Poland Penal Law Provision, 16 December 1941. Source: Reichsgesetzblatt I [Governement Gazette], p. 759 et seq. State Secretary Schlegelberger’s letter to Hitler, 24 March 1942. Article in the Völkischer Beobachter on Schlegelberger honorable discharge, 25 August 1942. Source: Völkischer Beobachter, 25 August 1942. Final statement of defendant Schlegelberger at the Nuremberg Military Tribunal, Case 3. Source: http://www.mazal.org/archive/nmt/03/NMT03-T0941.htm (8 January 2009). 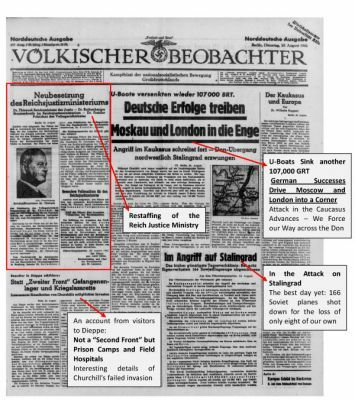 This case of Franz Schlegelberger (23 October 1876 – 14 December 1970) is an example of a German perpetrator and highlights the way in which the Nazi regime could rely on the support of the legally trained traditional "elites". Furthermore the example of a top-official from the justice ministry lends itself well to a discussion of the inherently precarious relationship between law and power. Following a career as a judge in various courts including Berlin’s higher district court (Kammergericht), Dr Franz Schlegelberger joined the Reich’s Ministry of Justice in 1917 and was appointed state secretary in 1931. Schlegelberger also taught law in the University of Berlin and was a well known jurist who even travelled to Latin America in September 1929. He remained in office when the national-conservative Franz Gürtner (26 August 1881 – 29 January 1941) was appointed as Reich’s Minister of Justice in 1932 and remained in his post when Hitler formed a coalition government with the national conservative party (DNVP) in January 1933. Whilst formally trying to maintain the rule of law, the civil servants in the Ministry of Justice soon became accomplices in sacrificing fundamental legal principles and abolishing legal guaranties. 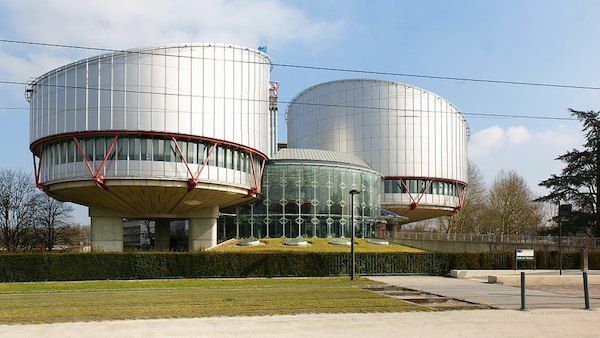 They played an important role in covering-up the systematic erosion of the law and eventually became the bureaucratic backbone of the Nazi Regime, which used the law principally as an instrument of suppression in order to implement its criminal policies under the cloak of legality. In so doing Schlegelberger and his colleague, the other state secretary Dr. Roland Freisler (since 1934) participated in the elaboration of numerous laws, which served to ostracise Jews from the legal system and eventually from society as a whole. When Gürtner died in 1941, Schlegelberger was appointed by Hitler as acting minister of justice, although he had only become a member of the Nazi Party in August 1938. As an acting minister of justice Schlegelberger played an active role in the elaboration and adoption of ever more radical laws to extent the discrimination and persecution of Jews. He chaired a major conference on the implementation of the so-called euthanasia (systematic killing of handicapped people), contributed to drafting the harsh Penal Law Regulation on Poles and Jews in the occupied Eastern Territories and in November 1941, he was among those whom Heydrich invited to what was to become the infamous Wannsee-Conference (eventually Roland Freisler attended as Schlegelberger’s deputy). "The measures for the final solution of the Jewish question should extend only to full Jews and descendants of mixed marriages of the first degree, but should not apply to descendants of mixed marriages of the second degree. […] With regard to the treatment of Jewish descendants of mixed marriages of the first degree, I agree with the conception of the Reich Minister of the Interior, which he expressed in his letter of 16 February 1942, to the effect that the prevention of propagation of these descendants of mixed marriages is to be preferred to their being thrown in with the Jews and evacuated. It follows therefrom that the evacuation of those half-Jews who are no more capable of propagation is obviated from the beginning. There is no national interest in dissolving the marriage between such half-Jews and a full-blooded German. […] Those half-Jews who are capable of propagation should be given the choice to submit to sterilization or to be evacuated in the same manner as Jews." Shortly afterwards in August 1942, at the age of nearly 66, he was honourably discharged and replaced by Otto Thierack, a radical who was closer to the Nazi-Party. 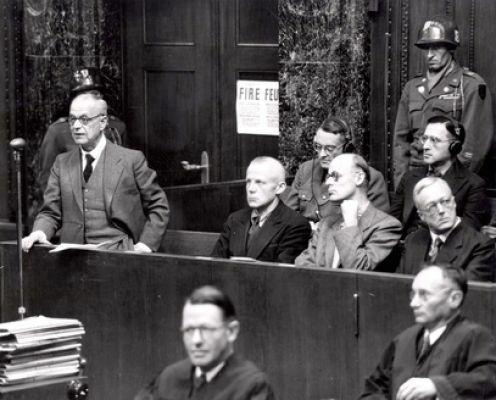 After the war Schlegelberger was indicted in the Nuremberg Judges’ Trial (Case 3) and sentenced to lifetime imprisonment in 1947. He was released in 1950 on "health grounds" by the American High Commissioner for Germany. With the support of his son Hartwig, who played a prominent role in the Federal State of Schleswig Holstein, Schlegelberger successfully fought for his pension in the late 1950s. He died in December 1970 in his home in Flensburg in North Germany.